2) STACKED WITH 26 POWERFUL MAGNETS, SEWN in the reinforced edges. Never Breaks & No Gaps. 3) THE "VELCRO MILE". The ENTIRE FRAME is lined with Super-Duty, Reinforced velcro along EVERY inch. Read: There needs to be a 1" overlap OVER the door opening to Attach the Velcro. 100% GUARANTEE. "MEASURE TWICE, ORDER ONCE! ">> Fits doors UP TO 34" x 82" MAX. 1) MAGNETIC SCREEN DOOR NIRVANA. If you've tried other flimsy magnetic screen doors before, you'll notice the difference right away. 1 Best Screen has toughest, heavy mesh construction. Mosquitos and biting bugs stand no chance. 2) PUTTING THE MAGNETIC MAGIC BACK INTO MAGIC MESH SCREEN DOORS. 1 Best Screen has the full 83" height stacked with 26 powerful magnets - BURIED in the reinforced adjoining edges, so they'll never break or fall off. NO GAPS along the entire vertical closure = No bugs. 3) THE "VELCRO MILE". 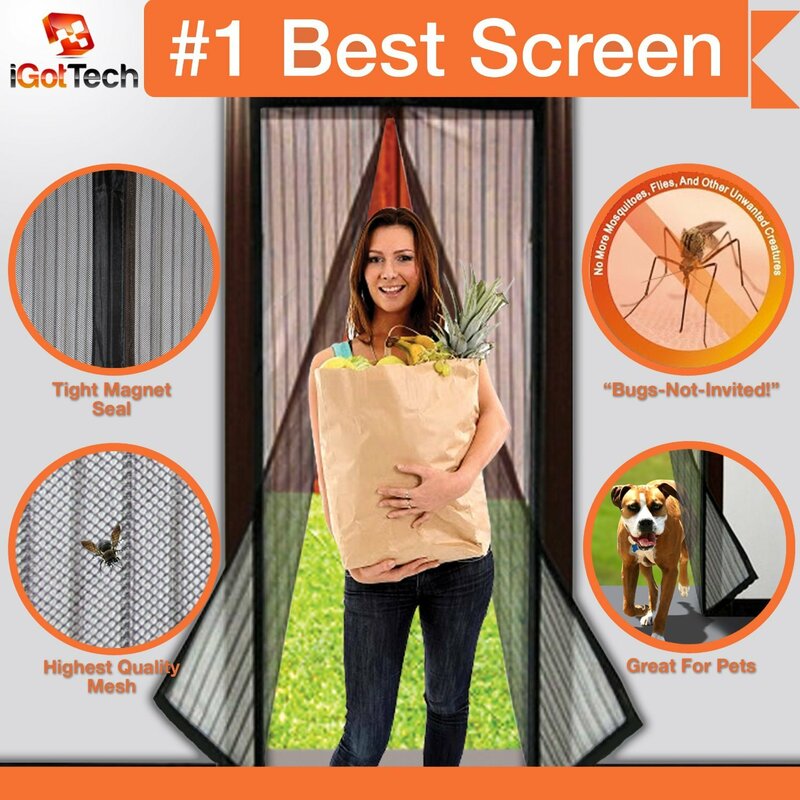 The ENTIRE FRAME of iGotTech's 1 Best Screen is lined with reinforced velcro. NO OTHER screen door offers this. With super-duty velcro around EVERY inch along the top and both sides, and additional support nails included, there's NO chance of this screen falling down, and NO chance of bugs. 4) KILLER VIDEO TUTORIAL. iGotTech's Creative Department fails us not. See directions in package to view instruction tutorial, ensuring you get your 1 Best Screen quickly installed right the first time, to maximize bug-free bliss. 5) OUR FAMOUS "BUGS-NOT-INVITED" CONSTRUCTION GUARANTEE. If our 1 Best Screen construction quality, or anything about our product is not up to par: WE WANT TO KNOW. Our Top Priority is your satisfaction, and stand behind our products 100%. That means if you don't like it, you can return it for a FULL refund, no questions asked. Simple as that! You literally RISK NOTHING trying this Premium Product Today. > Get 1 Screen for the Front Door & 1 for the Back, Side, Sliding, or Side Garage Door! >> Click that yellow "ADD TO CART" BUTTON NOW to get YOUR Bug-Free-Bliss On while these Screens are Still in Stock!